The Commonwealth of Virginia has enacted special rules and penalties for the drug crime of manufacturing methamphetamine. The reason for this approach is simple. The manufacturing process for methamphetamine involves dangerously toxic chemicals. Years after the manufacturing ends, the process leaves behind fumes and residue from the chemical process. If ingested or inhaled, these chemicals can lead to serious bodily injury or worse. This can be a severe issue in apartment complexes, if the manufacturing fumes leak into a centralized air vent. Given this negative externality of methamphetamine manufacturing, Virginia imposes a cleanup duty as part of the penalty process. In larger terms, a convicted manufacturer of methamphetamine must pay to clean up, repair, or restore any damaged property. Code of Virginia 18.2-248 provides an overview of laws and penalties for the manufacture of methamphetamine. Essentially, it is illegal to manufacture, sell, or distribute methamphetamine in Virginia. Any person who violates Section 18.2-248 by manufacturing methamphetamine is subject to severe penalties, as outlined below. A first conviction for manufacturing methamphetamine is punishable by 10 to 40 years in prison and $500,000 in fines. A second conviction for manufacturing methamphetamine is punishable by 10 years to life in prison and $500,000 in fines. A third or subsequent conviction for manufacturing methamphetamine is also punishable by 10 years to life in prison and $500,000 in fines. There is a three-year mandatory minimum term of imprisonment. Rendered unusable by methamphetamine production. Even if the methamphetamine manufacturer owns the damaged property, this cleanup obligation remains. In those cases, the methamphetamine manufacturer must submit payment to the Methamphetamine Cleanup Fund established in Code of Virginia 18.2-248.04. All payments to the Methamphetamine Cleanup Fund are reserved for exclusive use in the restoration of methamphetamine manufacturing sites. The convicted manufacturer is responsible for paying the reasonably estimated costs of repairing, cleaning, or removing the damaged property. If it is not possible to estimate the costs of cleanup, removal, or repair, then the convicted manufacture is responsible for paying $10,000. Additionally, the convicted manufacturer is responsible for the certification costs after completion of cleanup, removal, or repair. 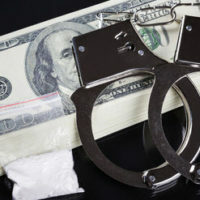 If you are dealing with charges for manufacturing methamphetamine or other drug crimes in Virginia, it is highly expedient to speak with an adept criminal defense attorney. The attorneys at Simms Showers LLP, servicing Leesburg, Winchester, Fairfax, and Manassas, have proven capabilities helping clients fight a variety of drug charges, including the manufacture of methamphetamine. If you need legal help with criminal defense, contact us today for a free initial consultation.